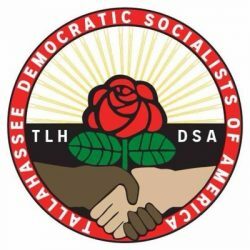 Tallahassee Democratic Socialists of America is one of nearly 200 local Democratic Socialist of America (DSA) chapters, organizing committees and youth chapters in the U.S. (www.dsausa.org), with a rapidly growing membership. As democratic socialists, we envision a society and a world where resources are democratically controlled to benefit all. In pursuing this goal, we educate the public about socialist values and policies and build progressive coalitions committed to fighting for economic and social justice. DSA is an educational organization (501(c)4), not a political party.